Caption for first photo: US Army Sergent Rudy Salcido at the start of his military career. 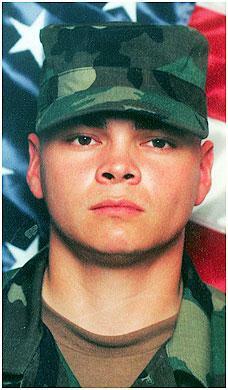 Salcido, 31, was killed in Iraq this week during his third tour of duty. Army Reserve Sgt. 1st Class Rudy Salcido, 31, loved his family, Texas hold 'em poker and the military. It was his passion for the Army that prompted him to sign up for a third tour of duty in Iraq. But Wednesday, Salcido, who was reared in La Puente, was killed while serving in Al Asad, Iraq. "I just want people to know that he died for something that he believed in," his father, Peter Salcido, said Friday. Salcido is the 20th person from the San Gabriel Valley to die in the war. The Iraq War death count as of Thursday was 2,838, according to the Department of Defense. "Ever since he was a little boy, he wanted to be in the Army," said stepmother Kathy Salcido at the family's San Dimas home. Salcido, who lived in Ontario, was the second-oldest of six brothers and sisters. Relatives said he valued his family life and made his 14-year-old daughter his top priority. Married in July, Salcido was sent to Iraq just three days after the wedding. He was expected home within 18 months. When family members spoke of Salcido on Friday, they smiled. "He made every situation funny," said brother Erik, including the time the family was playing Texas hold 'em and his father laid out five kings. "Rudy had a whole deck in his shorts, so he then laid down five aces," Erik said. "When he got up, the deck fell out of his shorts." Relatives describe him as loyal and fun to be around. "He enjoyed life," said aunt Nancy O'Neill. "He felt he needed to serve his country." 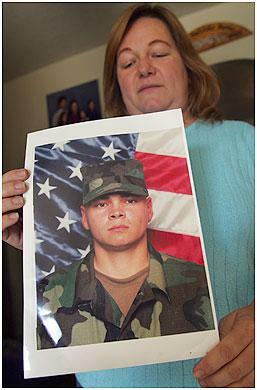 Family members said they didn't try to talk Salcido out of returning to Iraq for the third time. "We knew that's what he wanted," Kathy Salcido said. He is survived by his wife, Jennifer; father and stepmother, Peter and Kathy; mother, Maybelle Luvano; daughter, Gabriella; sisters Angelique, Monica and Crysania; and brothers Peter and Erik. 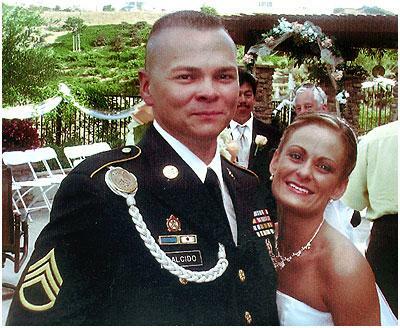 US Army Sergent Rudy Salcido and his wife Jennifer at their wedding July 15th 2006. Rudy was killed in Iraq this week during his third tour of duty.